Home » Business » Business loan » Loans » Your Business Loan was denied. What are your options? Your Business Loan was denied. What are your options? If your small business needs to meet shortfalls in cash for restaurants, contractors and retail stores alike you might have considered a term loans for help. Unfortunately, there are reasons why many small companies do not qualify for normal business loans. Your industry, credit score, collateral and operating history may all affect the loan decision. 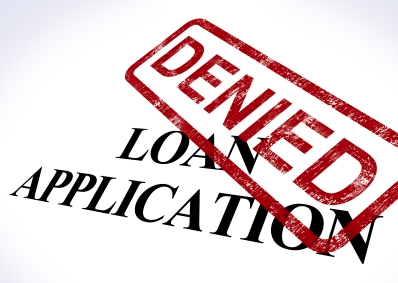 Have you been turned down for a business loan? You should understand why the application was denied and then find the best alternatives. The loan’s purpose, amount, and length are all factors to consider. By answering these questions first, you will cut financing costs(interest expense) and increase the loan’s ROI. Did your industry play a role in the loan decline? Many banks shy away from certain business models, such as restaurants, nightclubs, construction and even medical offices. Food service is seasonal with intense competition and high closure rates. Just think of the many restaurants that have closed in your area. The same factors along with changing trends affects nightclubs and bars. Contractors deal with slow downs based on the season and must often wait to get paid. Medical clinics must wait for insurance payments to clear and have high overhead for rent, equipment and staff. Solution? Consider Industry Loans, which cater to companies in certain fields. Industry lenders like BusinessLoansDirect.com cater terms to the cash flow, risks and potential of a various fields. For instance, nightclub financing considers the need to front costs for food, decorations and liquor for theme nights or private parties. Lenders who work with doctor’s offices or construction companies tailor their approval process to consider the effect of high receivables or seasonal dips on cash flow. Specialized loans may be an option if your loan is approved at a bank as well. Industry lenders may offer lower fees and more flexible terms than banks that approve your loan but with higher rates to compensate for added risk. If you operate in an industry with high closure rates, seasonal revenues or high A/R; an industry loan may an alternative. Venture capital is not just about mega dollar deals in Silicon Valley or Wall Street. Crowdfunding is private equity for the masses in amounts from a few hundred dollars to millions of dollars. There are various platforms to choose from and niche sites for particular industries, such as technology. With crowdfunding, you state a case for why your business, product or service needs funding to countless investors. Entrepreneurs offer repayment that may be traditional interest or shares of ownership in the case of equity crowdfunding, Meanwhile, donation crowd funding is based on goodwill. A business owner may offer discounts on services or plaques of recognition in exchange for money to buy equipment or pay down debt. Be sure to check if the crowdfunding site is ‘all or nothing’, which means you only get the money if your funding goal is reached. Kickstarter and Fundable are examples of such platforms. Conversely, Crowdrise and are flexible funding sites that allow you to keep all money raised. You should consider setting a lower goal on ‘all or nothing’ sites and have realistic repayment on any crowdfunding platform. In general, larger deals are better suited for ‘all or nothing’ platforms. Investors feel more secure knowing their cash will be only be used if needed funds are raised. This increases the odds of a loan being successful. Does your business need fast cash in smaller amounts? If your company accepts credit cards, merchant loans provide short term cash in exchange for a percentage of daily credit card sales. Merchant financing is an alternative to business credit cards or lines of credit to meet cash shortages. You can meet payroll, repair damage or have enough money for overhead with fast turnaround, typically just one to two business days. Companies can also use merchant loans as leverage to expand. A restaurant can bid on catering or private parties knowing that money to buy food and decorations is available. The volume and history of credit card receipts will affect the premium/payback. A business with more stable credit card receipts will likely have a lower % than a newer company with less merchant history. Your daily credit card sales will be tapped until the loan amount and premium are paid back. Make sure to calculate the ROI of a merchant loan beforehand, if possible. For instance, is the profit margin on a private party more than the premium you will pay for a merchant loan? You can make informed borrowing decisions by evaluating loan in this manner.